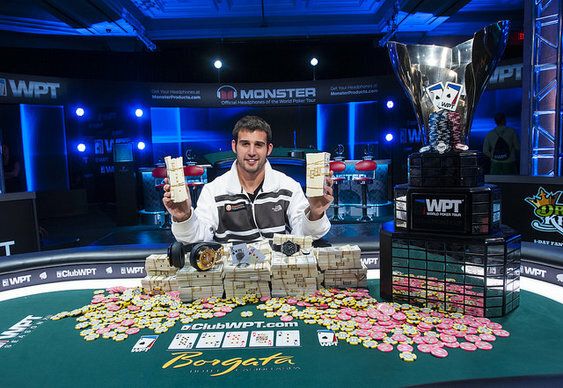 It was a case of third time lucky for Darren Elias at the WPT Borgata Open. The US pro had reached WPT final tables twice before without winning but made no mistake this time. Elias pocketed $843,744 and a seat in the WPT Championship after topping a 1,226 runner field in Atlantic City. The 27-year-old started the final table second in the chip counts behind Kane Kalas who consolidated his advantage with the elimination of Ray Qartomy just four hands in. His pocket aces proved too good for Qartomy's AJ. Kalas repeated the trick a hand later. Dealt pocket aces again, he sent Blake Bohn and his pocket queens to the rail in fifth. It was two hours until the next elimination with Kalas once again involved. Aaron Overton looked set for a double up after flopping an ace to accompany his A2 against Kalas' pocket jacks. A jack on the river changed everything and sent Overton out in fourth. Jose Serratos also succumbed to Kalas, losing a flip with K9 against Kalas' pocket sevens. Kalas started heads up play with a two to one chip lead but Elias lowly ground his way back into contention before taking control. The end, when it came, was a bit of a cooler with all the chips hitting the middle on a 10s7J4cKd board. Kalas tabled AK which was way behind Elias' K4. The board was a harmless 3s which gave Elias the title and huge six-figure score.